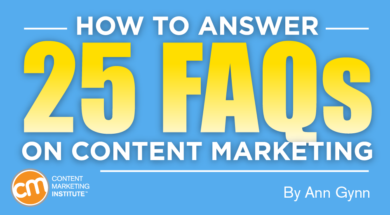 Editor’s note: This article is the follow-up to an August post about 25 frequently asked questions about content marketing. Do you get asked tough, or even easy, questions about content marketing by your executives or clients? Want a handy dandy cheat sheet to those questions? We are here to help. First, we asked the presenters at Content Marketing World to share the best questions they’ve been asked about content marketing. Some even shared their answers. Then, we asked the CMI community for additional answers. And, when we had a few unanswered questions, we curated responses from expert sources. Now, here are 25 questions you’re likely to be asked and how to answer them. 1. Should we do this? Too often clients say, “Can we do this?” They are so enamored by what’s new and possible that they don’t stop to ask whether it’s right for the audience, right for the message, and whether it could work. We just wrote about 99 benefits of content marketing. Among the benefits – shorter sales cycle (no. 4), complement to paid advertising (no. 10), and measurable custom conversion tracking (no. 25). 2. What is content marketing? This is a good wake-up call. We have to evangelize and educate the organization on how our content marketing efforts are helping drive the business. When I am asked by companies, I show them the website I worked on regarding content marketing and then search on Google for the keywords they rank for to show the value of content marketing. This helps them to know the actual benefit of content marketing. 3. Does content marketing work? What does it mean that your content marketing is “working?” In general, this means it’s supporting your marketing and business goals. Here’s a simple way to track your content marketing program and, more importantly, how to communicate this to your team and management. 4. How does marketing without talking about or promoting our product/service help us create leads and sales? Your current or future customer is not interested in your product, they are interested in solving a problem or challenge, usually both organizational and personal. By leveraging inbound marketing tactics companies can share content with the intention of inspiring their audiences. Instead of pushing out product information, content is intended to stand out based on elements such as authenticity, thought leadership, experience in solving those problems, etc. 5. Why would I want to educate my customers and help my competition? Loyalty, building a long-term relationship, and customer retention are three key components … Consumers today are oversaturated with many businesses providing the same product or service. By educating customers, they will make informed decisions and look to you as the subject matter expert. 6. How can content marketing help address our target audiences throughout the customer purchase journey? That question gets at the heart of how content should be used. Content should address the motivations and needs of the customer at various points of their process, so that it strengthens their positive feelings about the brand, heightens their likelihood to convert, and increases their customer lifetime value. 7. How can I use content marketing to increase brand presence in the most efficient way? First, make sure you’re inserting your brand into a conversation that’s relevant to both your offering and your audience. Missing that foundational mark is the content equivalent of getting on the wrong flight. Secondly, once you’ve identified your broad opportunity, do your homework – find the optimal intersection between conversation volume and conversation saturation. The goal is to tackle the topic(s) that are unexplored enough for you to own that still attract enough eyeballs to drive your bottom line. That calculus varies based on your product sale point, obviously, but the base principle is still the same. 8. How does content marketing drive revenue? 9. How do we measure content’s influence on sales and revenue? That one question drives the best decisions, the best priorities, and the best subsequent questions that drive impact. 10. How much is it going to cost? 11. What’s our goal? Why are we doing this? We were initially more focused on the what and the how questions. When our CEO asked the why question, it forced us to take a step back and get our short- and long-term goals down on paper. We’ve referred to those goals for five years. They’ve served as a great guiding star for the content program. The goals of content marketing are simple: you build your brand awareness by personalizing your brand, you establish yourself as a thought leader in your industry, and you increase traffic to your website with each post by using SEO friendly keywords. 12. What are we missing? It’s almost always that the content isn’t focused on creating a permanent change in how people see a situation, the brand, or the world. 13. What should we stop doing? I wish people asked this question. Marketing continues to be additive. Yet, to be truly creative – and offer something different and worthwhile – we need to deliberately do activities that make the greatest difference. 14. Does your brain spontaneously combust creativity? Where do you get your inspiration for some of these campaigns? Recently we got an opportunity to ask this very question to marketing veteran Tom Fishburne on how he creates these amazing “marketoons” week after week. He shares that what appears to be magic is actually ” stacks and stacks of paper and a lot of false turns and playing with ideas that never quite pan out.” In his view, it is ultimately about having faith in and following a consistent process. 15. Is my point of view unique so I don’t sound like every other agency (or company)? That means that your focus and concern should be more on your HOW than on your WHAT. What I am saying is this … Originality is more likely to be found in HOW you present your ideas than in WHAT ideas you present. You shouldn’t be tortured by the idea of having 100%, original content/ideas. Instead, you should be focused on the most original presentation of your ideas possible. These six areas are the real ways to create content that will be perceived as original and that will make your content stand out from your competition. 16. What are the editorial and commercial benefits of creating interactive content? The way society consumes content has changed. We can no longer expect users to simply scroll and consume text-heavy, dull, static content placed in front of them. Neuroscience points to a solution: interactive content is shown to awaken the brain and result in increased content memorability. It will power the future of storytelling. 17. What are we doing about voice search? Keyword research is more important now than ever. Specifically, in regard to capturing Google Home answers. Google provides most of its voice answers from the featured snippet (i.e., answer box) at the top of search results. Britney Muller, Moz, Voice Search: Is Your Content Prepared for the Verbal Revolution? HANDPICKED RELATED CONTENT: OK, Google. How Do I Optimize My Content for Featured Snippets? 18. How can I get my executives to create and share content for the company? Getting executives to buy into content marketing is an important step. And getting them to actively participate in your content as your company’s thought leaders is another. You need to put the leadership into thought leadership content and look for those leaders wherever possible. 19. How do I use content marketing to help other people in my organization? 20. How can we make something go viral? There’s no guaranteed formula. But no matter the industry, you can increase your chances if your content (1) presents a unique story, idea, or dataset (2) in a way that directly addresses a pain point or creates an emotional response in your core audience and (3) in an engaging format. And, that’s not enough. You have to promote the heck out of it. Leslie Carruthers, The Search Guru Inc.
“I can make this go viral for you.” This one has caused many a PR pro to smack his or her forehead in frustration. The only way to earn media coverage is to work hard at it by honing your message, choosing the right media targets, and being persistent. 21. Can we get beyond thinking we are the best answer and bring in others from our community? The reason I love this question is that someone recognized the importance of inclusivity. Being smart by having voices from outside the company could bring others closer to them. It also meant that people outside their immediate network would hopefully share with others and draw people closer in. As part of this client who asked this question, its editorial calendar now actively incorporates input related to their monthly topics from beyond their industry. 22. What’s the difference between audience and traffic? The question hints at where marketing is heading overall. A synonym for traffic is “visitors,” which by definition are people who leave. Today’s best content marketers develop audiences. They focus on subscribers, not visitors; time spent, not views; holding attention, not merely acquiring it. Your goal should always be to drive traffic to your content, so you can build an audience. 23. How many buyer personas do we need? 24. How do we manage all the different audiences? How to do we make sure our content is relevant to all of them? For example, instead of producing three original versions of an email, include the same offers and calls to action in all, but change the openings to address each audience’s unique pain points. 25. Why won’t people come to our content? The short answer is that people in charge lacked a basic understanding of SEO. A slightly longer answer is they didn’t do link building and outreach, or perhaps they didn’t produce content that was “linkworthy” in the first place. Create unique content that they can’t get anywhere else. If you’re just getting started, make sure you start with a WOW factor – for example, invite an influencer to write a guest post or interview a key figure in your industry. That will help you get initial traction. Invite them to come – Make sure you target the right audience that needs/wants your content and let them know the content is there, be it through social media, newsletters, SEM, or any other relevant channel. Don’t be spammy or salesy, just conversational and friendly. Be consistent with your content – Make sure to always have fresh content delivered so that your readers have a reason to come back. Encourage them to share your content so that others can learn about it and to help your content earn organic reach. And if 25 questions and answers aren’t enough for you, George Stenitzer takes it one step further – well, 75 steps further, in this post he shared on the top 100 content marketing questions and answers. But no matter the question, getting the answer right often requires you to frame as you would for your content marketing. It’s about delivering a relevant answer to the right person at the right time. Do you have a question you’re asked and want to know the answer to? Would you have a different answer for any of the questions above? Or perhaps you want to share a frustrating question with the community. Add your thoughts in the comments below. Missed Content Marketing World? You still can learn from and be inspired by over 100 speakers. Get video-on-demand access today. And save Sept. 3-6, 2019 for the next CMWorld.